In today’s world, a smartphone is not a gadget meant for grown-ups only. We increasingly see it into the hands of kids, who primarily use it to play games, communicate with friends, and surf the Internet. With parents getting more comfortable when they hand over an iPhone or even an iPad to their kids, it is important to keep tabs on children’s online activities so that not to disturb their privacy, but protect them from danger that is so easily accessible on the web. Statistically, 61% of teens prefer iPhones to other smartphones. Thus, monitoring apps for iOS are in demand these days. However, it seems to be rather hard to find reliable ones among them. Let’s take a closer look at iPhone parental control by Pumpic and see what makes it stand out from other similar applications. 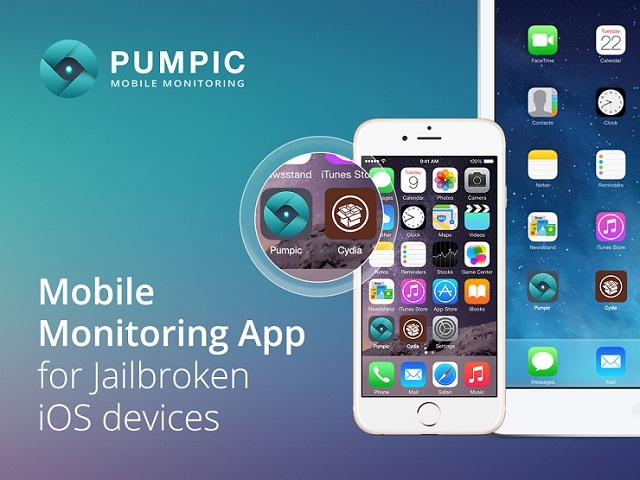 Pumpic provides impressive monitoring opportunities for iOS with jailbreak comprising more than 24 monitoring features (a shortcut version of the app for unjaibroken devices — the iCloud solution, includes as much as a half of available options). The app is compatible with iOS 6.0 — 8.4. The installation process is performed through the Cydia app. It does not differ from setups of other applications on jailbroken devices and should be familiar to our readers. Check incoming and outgoing calls and SMS. An essential function for you to keep track of people who call and message your children. It will let you prevent them from being reached by strangers. Track location, access route history, set geo-fences. Allows finding out where your kids currently are and where they were at any particular period. At the same time, by setting geo-fences you will be able to receive notifications when your children leave preset safety zones or enter restricted areas. Follow social networks and online chats. One of the most important features for child safety these days. Since most dangers kids face come from the Internet, monitoring Facebook, Instagram, Skype, Snapchat, WhatsApp, Kik, Viber, etc. is a must. Monitor browsing history and bookmarks, block websites. This option will let you check all websites your children visit, view their favorite sources, and block those including violent, sexually suggestive, or explicit content. 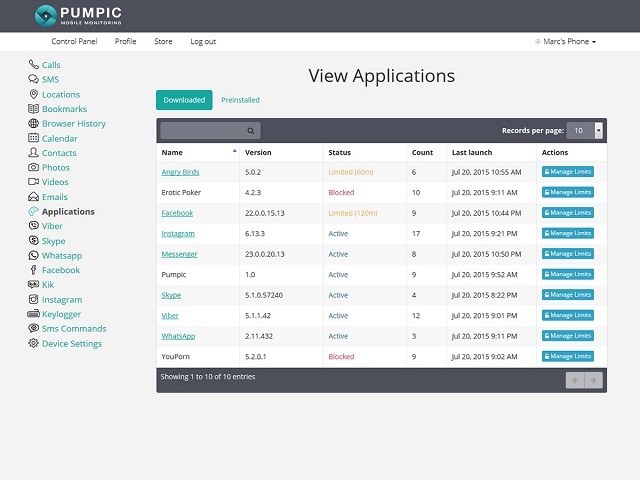 View installed applications, block apps from running. Smartphone overuse is a crucial issue among teenagers nowadays. This feature will let you control your kids’ screen time and block particular applications if needed. In addition to the features mentioned above, Pumpic also offers keylogger functionality to keep track of each button pressed, a remote device lock feature, remote activity control, and many other options. Pumpic not only provides access to what is on the phone but also shows you text messages and multimedia files deleted from it. The data from the target device is viewed and managed through the online Control Panel, which can be entered from anywhere. Using this Control Panel, you can block certain activities and set limits, without even touching kid’s devices. The Pumpic app comes with two subscription packages. The basic option costs $63.99 a year and offers limited functionality without monitoring of social networks, keylogger, and historical data. The premium package provides a comprehensive list of available monitoring features and costs $83.99 a year. The price may seem too high; however, if you buy a 6-month or 12-month plan you will get two extra subscription packages for free. So a 12-month plan makes the price as low as about $1.8/month for Basic and about $2.3/month for the Premium subscription per month for 1 device.